As most of you know, TBEX was acquired by BlogWorld & New Media Expo earlier in 2012. What you may not realize is that there was already a bit of overlap between the two conferences in terms of the people who grace the stage. Many TBEX speakers have been presenters at past BlogWorld events – including yours truly – and there’s a host of TBEX speakers in the line-up for the 2013 New Media Expo event next month in Las Vegas. 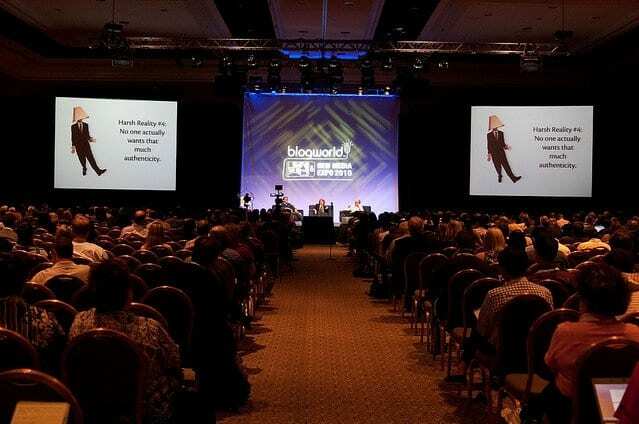 Here’s a rundown of NMX 2013 speakers who have also been TBEX speakers, plus what they’ll be talking about at NMX in January. Amy Porterfield – Amy delivered a keynote about Facebook marketing at TBEX in Girona, and her presentation on “companies that hit the bullseye with their social campaigns” is part of BusinessNext. Andy Hayes – Andy has been involved with the travel blogging community for years; his NMX presentation is called “Live Website Critiques: When You’re Too Close, You Can’t See It.” He’ll be doing a live walk-through of a few websites as a demonstration of what to look for in terms of usability. CC Chapman – CC’s an incredibly passionate and energetic speaker (as anyone who saw his sessions in Girona will attest), so I’d bet that his NMX presentation on “How To Add Photography Into Your Marketing Mix” will be a fun one. Monica McCarthy – Monica led a session on video at Keystone, and her NMX presentation is called “Got Video? How to Get On-Camera Ready.” If you’d like to be more confident on camera, this session should help. There are a couple other travel-y folks on the 2013 New Media Expo speaker roster – including Ellen Gerstein, formerly with the publisher of Frommer’s guidebooks, talking about where a book might fit into a blogger’s existing platform, and Lou Mongello, of the popular WDW Radio program, talking about finding sponsors for your brand.